Appearing as a guest on Monday's Charlie Rose show on PBS, CNN legal analyst Jeffrey Toobin seemed to misunderstand conservative complaints about judicial activism as he seemed to suggest that any court rulings that strike down legislative action could be considered part of judicial activism. The CNN analyst charged that the Supreme Court of the United States has recently engaged in "conservative judicial activism" in its enforcement of the First and Second Amendments. Missing the point that "judicial activism" often involves a distortion of the Constitution's words to find legal precedent that does not exist, Toobin characterized recent decisions by a "very aggressive conservative wing" of the court as activism: "But what we have seen in recent years is conservative judicial activism, telling Congress you can't ban, you can't regulate campaign finance the way you thought, you can't - state legislatures, city councils - you can't impose gun control. So you have a very aggressive conservative wing of the party telling the democratically elected branches what to do." Minutes earlier, he had described Chief Justice John Roberts as "very, very conservative." 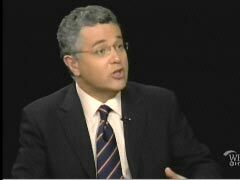 JEFFREY TOOBIN, CNN LEGAL ANALYST: I would differ a little with Adam [Liptak] on, you know, on Roberts. I mean, I think Roberts is very, very conservative, and I think he's trying to push the court in a conservative direction across the board. This is a guy on a mission, and I think he's doing it in an honorable way, he's doing it, you know, within the rules, but I don't think there's any mistaking what he's doing there. So, I mean, you know, and that suggests no disrespect for the institution, it just tells us what he's up to. CHARLIE ROSE: It was my impression that the conservative wing of the court always basically said if it's not in the Constitution, then it may be unconstitutional, you know, some piece of legislation, but my understanding was, their argument was frequently that the legislature went too far, point one. Point two, Justice Breyer at this table and others have shown a certain deference for what the Congress does, and respect. Are those two ideas in conflict? ROSE: Or am I wrong about my assumption? TOOBIN: No, no, but the words that get to what you're talking about are "judicial activism" because that was a traditional epithet flung at liberals - with some justification. ROSE: And at the Warren court. TOOBIN: And at the Warren court. You know, telling police what to do, telling states they can't abort, they can't ban abortion, telling states they have to integrate their schools. But what we have seen in recent years is conservative judicial activism, telling Congress you can't ban, you can't regulate campaign finance the way you thought, you can't - state legislatures, city councils - you can't impose gun control. So you have a very aggressive conservative wing of the party telling the democratically elected branches what to do. -Brad Wilmouth is a news analyst at the Media Research Center.